Note: The exploration for this post was done in 2011 while I lived in The Netherlands. Artichokes haven’t appeared in any store aisles in Nigeria (that I’ve come across anyway….). I am sharing it because I unearthed some ‘gems’ in the process. I hope you enjoy reading it. None of my memories, sleeping or waking…have been consumed with artichokes of any sort. Globe or Jerusalem, pickled, boiled, fried or grilled. Australia’s cooking doyenne, Stephanie Alexander says in her book, ‘The Cook’s Companion’, a compendium of ingredients and recipes for the Australian kitchen ‘Artichokes have a reputation of being tricky to prepare and fiddly to eat. As a result, many food lovers have yet to tackle their first boiled artichoke’. She spoke of me. A food lover terrified by thistles and thorns….of the artichokes. I’ve tackled Mr. Lobster, almost fearlessly. I’ve even endured the sliminess of pulpo aka octopus…..and cleaned an entire one. Forget that I could not bring myself to eat it. But the artichoke, thorny veg that it is, scared me silly. 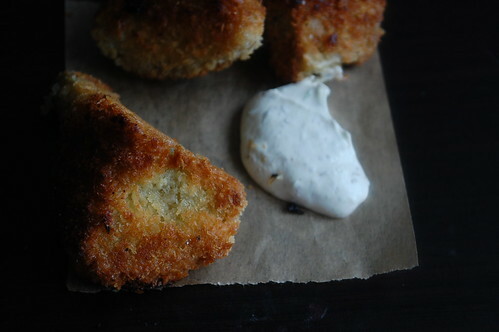 Till I went to bed one night in July thinking, ‘Oh the artichoke, what fun it would be to cook one’. 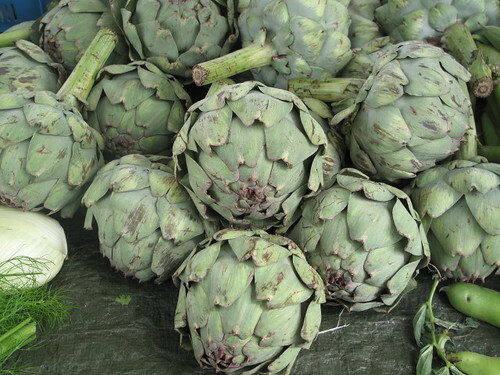 Did you know that the artichoke is a large bud, harvested before it has a chance to bloom? And of course edible. 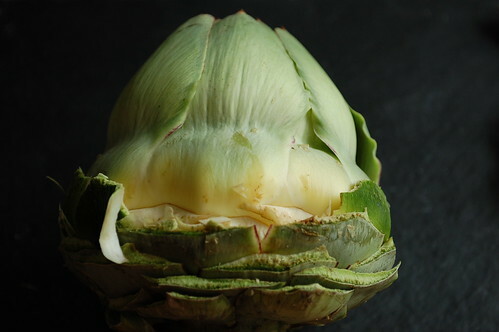 And did you know that baby artichokes are not immature artichokes (like most baby vegetables), they are simply smaller versions grown lower on the plant. So here we are. And even though I’d never actually cooked artichokes before, I have had numerous brushes with them. And I say brushes because the encounters have been brief, with no memorable experiences to stretch the event beyond the ‘then’. A bowl of pickled artichoke hearts purchased from the Mediterranean deli makes its way into a salad at home. And as with some pickled things, the sense of the true taste is lost, gone forever and replaced by the slight tang and souring of vinegar, lemon of whatever pickling liquids have been employed. Truly, I have nothing against pickles. They serve a purpose in their own right…..purpose though which I will not allow guide me on this voyage of discovering all about artichokes. I remember months ago, Food52 had an artichoke contest and quite unlike me, I stayed well away. To me it was like meeting a complete stranger – one I had absolutely nothing in common with, and was done judging….. from a distance. 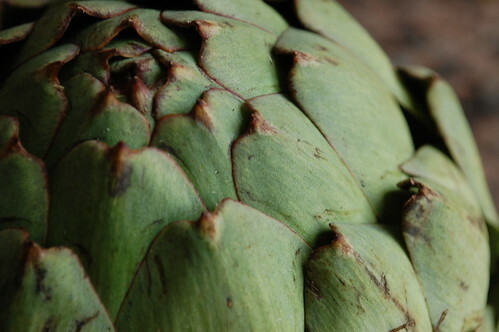 As vegetables go, the Artichoke is among the most fascinating visually. It is as beautiful as it is delightful to eat. You may be interested to know that the Artichoke is actually the bud of a plant from the thistle family and at full maturity, the plant grows to a width of about six feet and a height of three to four. If not harvested from the plant, the bud will eventually blossom into a beautiful, blue-violet flower, which is not edible. The globe artichoke (Cynara cardunculus var. scolymus) is a perennial thistle of the Cynara genus originating in Southern Europe around the Mediterranean. It grows to 1.4–2 metres (4.6–6.6 ft) tall, with arching, deeply lobed, silvery, glaucous-green leaves 50–82 centimetres (20–32 in) long. The flowers develop in a large head from an edible bud about 8–15 centimetres (3.1–5.9 in) diameter with numerous triangular scales; the individual florets are purple. The edible portion of the buds consists primarily of the fleshy lower portions of the involucral bracts and the base, known as the “heart”; the mass of immature florets in the center of the bud is called the “choke” or beard. These are inedible in older larger flowers. Once you know how, they are quiet easy to prepare. First, take a look at this diagram and the photo below to familiarize yourself with the anatomy of an artichoke. Note that the choke is inedible. Some people eat the stem after removing the fibrous outsides of it. 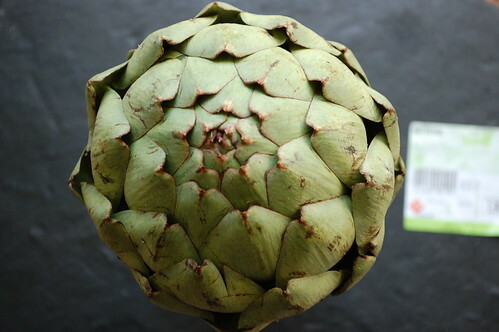 Rinse the artichoke in the sink, and tap it, pointy-side down to remove any critters that may be hiding in the leaves, especially if you purchased organically-grown artichokes. Now, cut off the top quarter of the artichoke with a knife. Then, cut off the stem if you want. Some people like to leave it on because it tastes good! 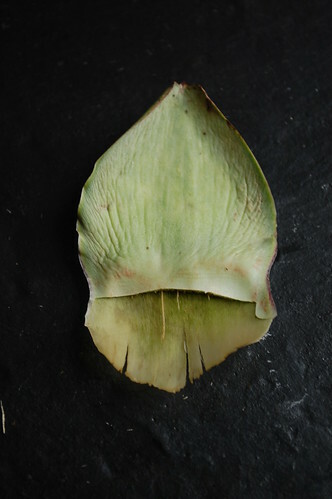 Using kitchen shears, snip off the pointy ends of each leaf; you don’t want to get pricked! 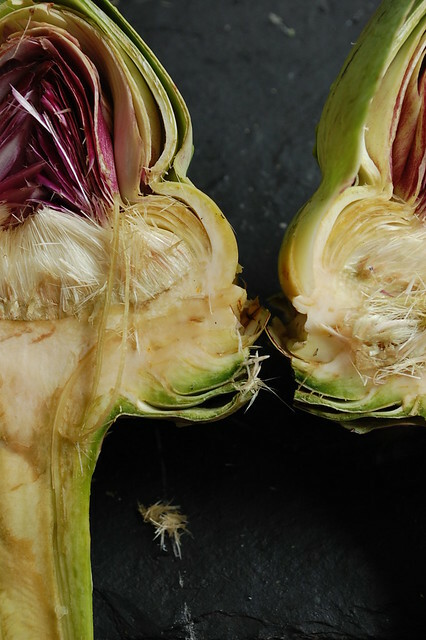 In Italy, before women buy their artichokes or carciofo, they rub two together. If the artichokes squeak on contact, they are deemed ‘fresh’, if they stay muto (silent), they are not. My friend E tells me a story from when she was young and they had artichokes at a large family meal. While everyone ate theirs artichoke petals, dumping the remnants in a pile and chatted, she sat quietly eating the entire petal, one after the other. At the end of the meal when it was time to clear up, everyone had nice dignified piles of half-eaten petals on the side and E?….Well, her plate was clean. 30 years later she still gets looks of disbelief and wonderment from her cousins….all because she left little of her artichoke behind! Artichokes should never be cooked in aluminum pans or they’ll discolour the pan. To preserve their colour and bring out the flavour, artichokes are often cooked with a pinch of sugar, lemon juice, apple cider or white wine vinegar with salt. 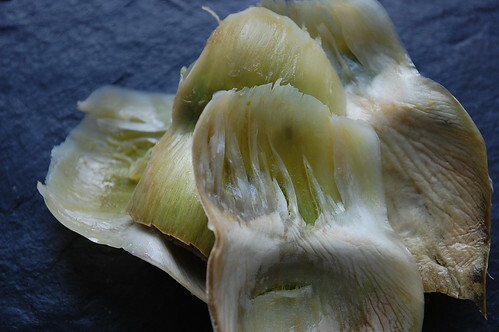 Cut artichokes will quickly turn grey when exposed to air. To prevent this, submerge them in acidulated water (which has some lemon juice). Finally I am ready to tackle it in varied forms. First the classic steamed or boiled, whole. Simply does it. Once ready, I sat at a table. 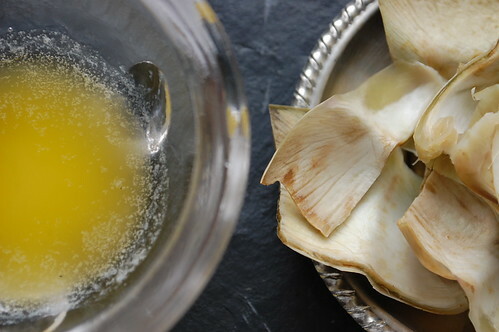 The artichoke petals were plucked off and dipped in melted butter as I worked my way from rim to centre. 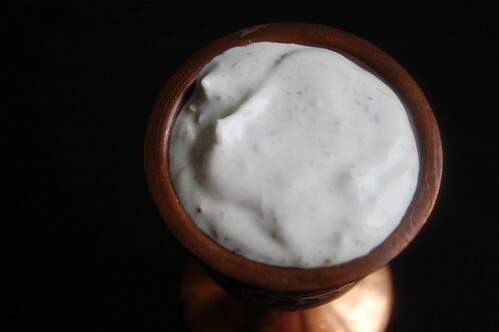 To eat, you dip the bottom/end of the petal which is thick and meaty and full of soft pulp into your condiment of choice (melted butter, olive oil, mayonnaise or some other sauce) while gripping the thin, upper (formerly thorny tip) end. You place the dipped end in your mouth, clamping down your teeth and pulling the petal through to remove the soft, pulpy, delicious portion of the petal. Then you discard what’s left (which isn’t much but tough petal). When I had peeled off all the petals, I sat down to finish off the heart which while meaty, I did not find as tasty as the petals. Odd, I thought to myself. 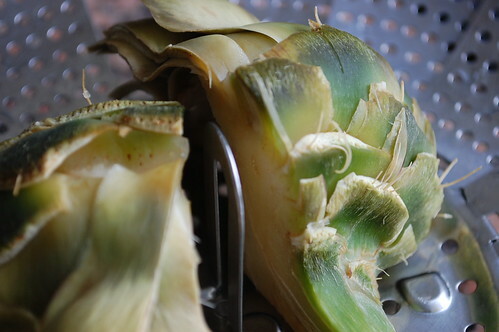 It involved cleaning and quartering the artichokes and then frying in olive oil. 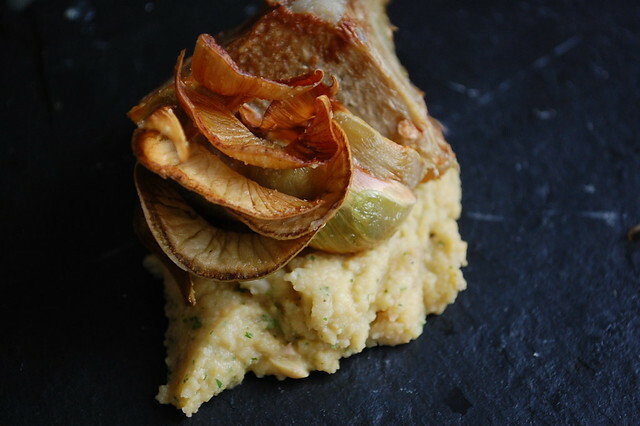 When ready, I salted the artichokes and sat down to dip the petals in a chickpea puree. This was a stunner for me. 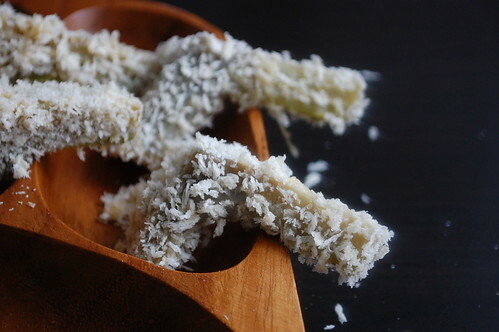 The petals took on a delicious caramelized flavour – transforming the sweet pulp and raising it way beyond just steamed. The heart was nice but again, it was the petals that shone and took the ‘star’ spot. …. served with a cumin-lime dip. Which combined some of my favourite flavours ever. The fragrance of the lime and the smokiness of the cumin. Heaven. I wondered from the start if this would reverse my view on the hearts. And oh boy, did it do just that. These were delicious. I loved discovering artichokes; the ‘meat’ on the petals reminds me of avocados-sweet potatoes-yams. And the finish/aftertaste? Fine….till you drink something and then your mouth tastes sweet. Reminds me a bit of the liquorice effect. 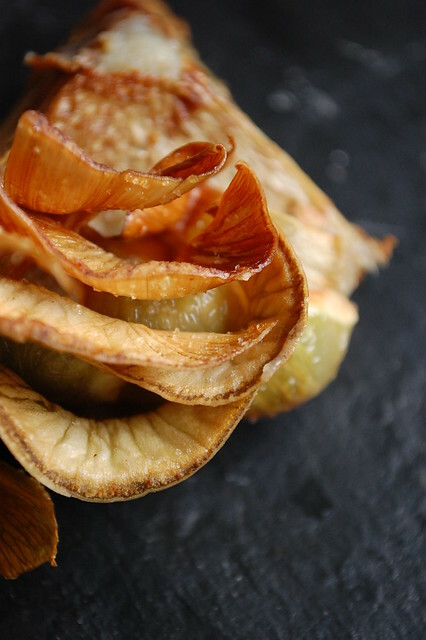 Overall, my favourite recipe was #2 – I loved the fried petals – something wonderful happens in hot oil – caramel notes develop and there is a fullness of the artichoke flesh which turns to ‘cream’. 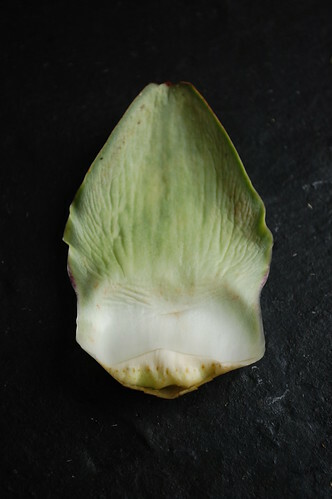 I could see myself eating my way through a dozen artichokes petals! Strangely, the hearts were nice but I’m not fully converted. I found it too meaty…my palate preferring the simple ‘teeth and eat’ petals.